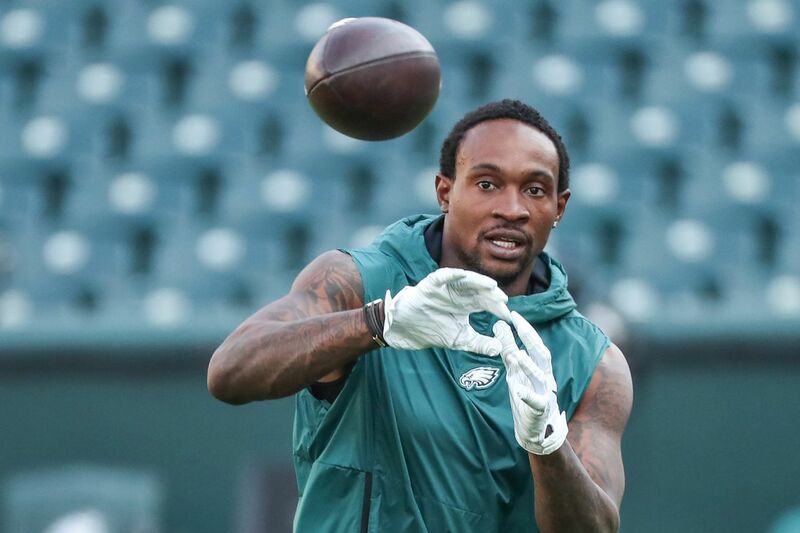 Eagle reciever Alshon Jeffrey plays catch during warm ups prior to the game against the Falcons at Lincoln Financial Field on September 6, 2018. Carson Wentz and Alshon Jeffery highlight the Eagles' inactives for Thursday's season opener against the Atlanta Falcons, although both players were already declared out. They were joined by offensive linemen Jordan Maialata, Matt Pryor and Chance Warmack; and defensive end Josh Sweat. Mailata, Pryor and Sweat were draft picks this year. Their absences are not a surprise. The Eagles are playing rookie defensive tackle Bruce Hector over Sweat, although the team is deeper at defensive end than defensive tackle. All of their linebackers are active, including newly acquired D.J. Alexander. At wide receiver, the Eagles have Markus Wheaton and DeAndre Carter active. They moved up the depth chart with Jeffery inactive and Mack Hollins on injured reserve. The Eagles have Isaac Seumalo and Halapoulivaati Vaitai as the backup offensive linemen. They usually have one backup interior lineman and one swing tackle. Nate Sudfeld is the backup quarterback on Thursday with Wentz out of the lineup. All four running backs are active for the Eagles, including Wendell Smallwood. All three tight ends are active, including Joshua Perkins, who is making his Eagles debut against his former team. Wentz and Jeffery both worked out together on the field before the game.